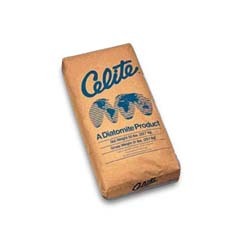 There are many types of filters on the market today and the D.E. pool filter is one of the best for cleaning the most debris out of your swimming pool water. The way a D.E. differs from a sand and cartridge filter is that it uses powder commonly referred to as “earth” or D.E. powder. The term D.E. stands for Diatomous Earth and it is a white powder that can be bought online or in any local swimming pool supply store. The first thing you will have to do before you add more D.E. powder to your swimming pool is to back wash the swimming pool filter. Once you have back washed and rinsed the filter you will be ready to add more earth to it. You will never want to add more D.E. powder to your swimming pool unless you back wash it first. 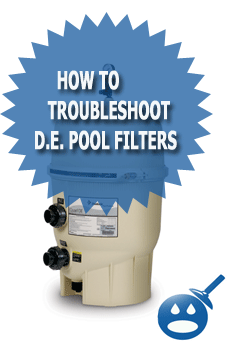 If you over load your pool filter with D.E. you will have earth come back into the pool. Once the D.E. earth gets into the pool it can easily make a mess that you will have to spend time vacuuming up. Once the filter is back washed you will want to look on the side of the filter and see how many pounds of D.E. powder are required. As a rule of thumb you will want to add 1/2 cup less of what the filter say on the tank. This is because naturally some of the filter media will be left inside of the filter even after back washing. 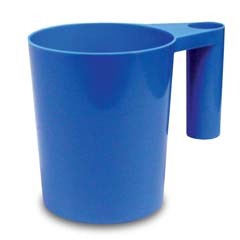 Adding 1/2 cup less just ensures that the filter will not be overloaded with D.E. powder. Now that you know how much D.E. 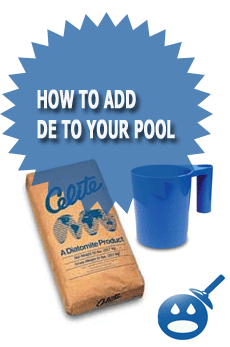 powder your filter needs you will want to add it to the pool through the pool skimmer. You will always want to add the D.E. powder to the closet skimmer. To add the D.E. powder you will need something to scoop and measure it with. A 1 LB empty metal coffee can is equal to one LB of D.E swimming pool powder. So if your pool filter says that it requires 5 1/2 LBS of D.E you will want to add 5 coffee cans full of D.E powder. Remember as we said above you want to minus 1/2 pound from the start and then each coffee can is equal to one pound of earth. You will want to add no more then one pound of earth at a time. If you add to much D.E. powder at once you can clog up your skimmer. The best way to add the D.E. powder is to fill up your 1 LB scoop and then dump the powder into the skimmer and wait until the water is clear again before adding the next scoop. If you add the D.E. powder like this you will never wind up with a clogged skimmer. Once you have added the correct amount of Diatomaceous Earth Scoop to the filter you can put the skimmer lid back onto the skimmer. You will also now want to walk over to the pool and make sure that no D.E. powder has entered the pool through the return fittings. If you do happen to see D.E. powder in the pool this will mean that either your filter is overloaded with earth or there is something wrong with the filter that is allowing D.E. back into the swimming pool. There are a few reasons why you will see D.E. powder in the swimming pool. You could have a bad multiport valve, you could have bad filter grids or fingers, you could have a cracked filter manifold or the filter could be just completely full of D.E. and it just needs a good cleaning. of truly get useful data concerning my study and knowledge. you for all the superb pointers you are giving out on this site. My incredibly long internet lookup has at the end of the day been honored with useful facts to share with my partners. many special individuals with beneficial tips and hints. Some really excellent info, Sword lily I discovered this. « How To Clean A Skimmer Basket?